Be the first to share your favorite memory, photo or story of Lorrayne. This memorial page is dedicated for family, friends and future generations to celebrate the life of their loved one. 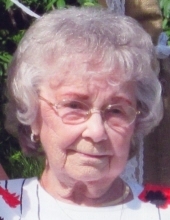 Lorrayne Leeder, age 94 passed away February 27, 2019 at The Heights Assisted Living in Evansville. Lorrayne was born October 22, 1924 in Stoughton Wisconsin to Garold and Esther (Johnson) Larson. She married Frank Leeder in 1943 and together they had three children and farmed outside of Evansville for many years. They later divorced and she worked for Varco Pruden Steel Building manufacturing until her retirement. Some of her favorite things included cheering on the Green Bay Packers, going to the casino, crocheting and visits from her "Grand dog" Bear. She is survived by her brother Vern (Barb) Larson, her children; Sharon Vajda of Greers Ferry, AR., Diane (Terry) Allen, Steve (Mary) Leeder both of Evansville, her grandchildren; Mike (Molly) Leeder, Evansville, Kristi (Jon) Bjoin, Janesville, Mark Spanton, Peoria, AZ., great grandchildren; Weston, Will, and Charlotte Leeder, Rafe and Kane Bjoin, and Alexa Spanton. Five nieces and nephews. She was preceded in death by her parents, her sister Geraldine Fish and a nephew Tim Fish. We would like to send a special thank you to her "girls" at the Heights. She loved and "Adopted" many of you during her eight years of living there. Your loving care meant the world to her and to us. She loved you and we love you. A memorial service will be held at 11:30AM on Saturday March 9, 2019 at Covenant Lutheran Church in Stoughton With Pastor Sara Rabe officiating. Inurnment will follow in the Covenant Lutheran Church Columbarium. In lieu of flowers she requested any memorials be made to the Humane Society of Southern Wisconsin 222 S. Arch Street Janesville WI. 53548 or Kadlec Ranch rescue 6654 West Ridge Drive Janesville WI. 53548. To plant a tree in memory of Lorrayne Muriel Leeder, please visit our Tribute Store. "Email Address" would like to share the life celebration of Lorrayne Muriel Leeder. Click on the "link" to go to share a favorite memory or leave a condolence message for the family.